Diesel are bringing 35 years of Denim experience to their new Diesel Denimize Collection. Inspired by the cult casualwear brand’s denim expertise, the new range of Diesel Denimze Eyewear incorporates unique Denim inserts into the frame construction. But this is no ordinary Denim… The fabric is sourced in Europe and each insert is selected from the richest, most tactile section of the fabric before being manually inserted into the temples. The result is that each pair of glasses is subtly different, just as each pair of jeans is never the same shade or tone. This artisanal approach is unique in the eyewear marketplace. 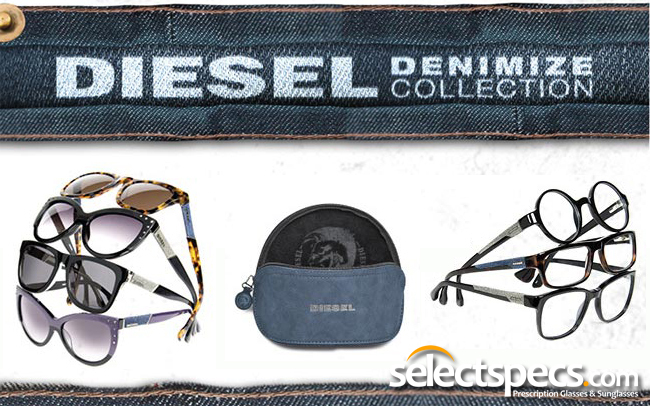 The Diesel Denimize Collection features three optical frames and two sunglasses, with blue or grey Denim inserts. The packaging also reflects the Diesel DNA: Both sunglasses and optical frames are presented in custom made Denim cases, designed and produced specifically for this collection. Other colour options available, click the frame images below for more information. Diesel DL5030 Prescription Glasses with Denim temples. Diesel DL5031 Prescription Glasses with Denim temples. Diesel DL5032 Prescription Glasses with Denim temples. Diesel DL0050 Sunglasses with Denim temples. Diesel DL0051 Sunglasses with Denim temples.